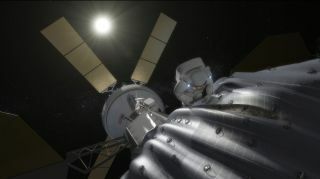 This concept image shows an astronaut preparing to take samples from the captured asteroid after it has been relocated to a stable orbit in the Earth-moon system. Hundreds of rings are affixed to the asteroid capture bag, helping the astronaut carefully navigate the surface. Image released Aug. 22, 2013. As NASA continues to plan out its ambitious mission to snag an asteroid and park it near the moon, the space agency will consider nearly 100 ideas submitted by potential partners. NASA has selected the top 96 proposals of more than 400 submitted by outside groups in response to a June request for information (RFI) designed to aid its asteroid-capture mission and improve humanity's ability to protect Earth from dangerous space rocks, officials announced today (Sept. 4). The chosen proposals are broad and varied, addressing how to slow down an asteroid's rotation rate, nudge it off a potential collision course with Earth and grab samples for scientists to study here on our planet, among other topics, officials said. NASA will examine the 96 concepts further during a public workshop from Sept. 30 through Oct. 2, enlisting the help of experts from within and outside the space agency. NASA announced the asteroid-retrieval mission in April. The agency plans to drag a roughly 25-foot-wide (7.6 meters), 500-ton space rock to a stable orbit near the moon with a robotic probe. Once there, the near-Earth asteroid could be visited by astronauts using NASA's Orion capsule and huge Space Launch System rocket (SLS), both of which are in development. Grabbing a space rock would also help develop asteroid-mining technology, yield insights about the solar system's early days and give humanity crucial experience working in deep space, advocates say. The plan has its detractors, however, notably people who would prefer that NASA use the moon as a stepping stone to Mars. In June, for example, the U.S. House of Representatives' Science space subcommittee drew up a draft authorization bill that would nix the asteroid-retrieval mission and direct astronauts back to the moon.